VICOM has announced the Allegro call generator from Ameritec Corporation, for development and portable applications. The new call generator product has been designed for the developer and those applications where portability and cost management are mandatory requirements. Allegro, the world's smallest, fully-featured analogue and digital network load generator is available in two configurations. The digital product supports four software selectable T1 or E1 spans and is a full-featured product that supports CAS, PRI and SS7 signaling formats as well as Ameritec's industry-leading QoS measurement suite that includes GMOS, G-PSQM, G-PESQ and R-Factor scoring. 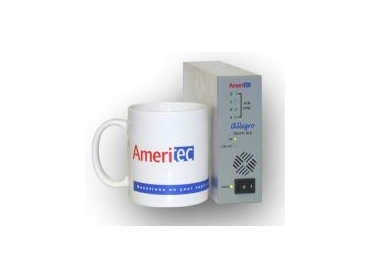 The analogue Allegro supports four analogue circuits; complete with loop and ground start signaling and Ameritec's industry leading QoS measurement package. The key technology associated with this innovation is the use of the enhanced GoldenVoice stimulus released in VoP3/GMOS to produce the measurements required by the E-Model equation for calculating the R-factor and resultant GMOS, G-PESQ and G-PSQM scores. Based on the configuration of the call generator(s) the GMOS, G-PESQ and G-PSQM values can be calculated on all lines/channels simultaneously by the GoldenMOS application in FeatureCall Millennium. The application is easy to use, yet is powerful enough to report both the quality and performance of a packet-switched network transporting voice.